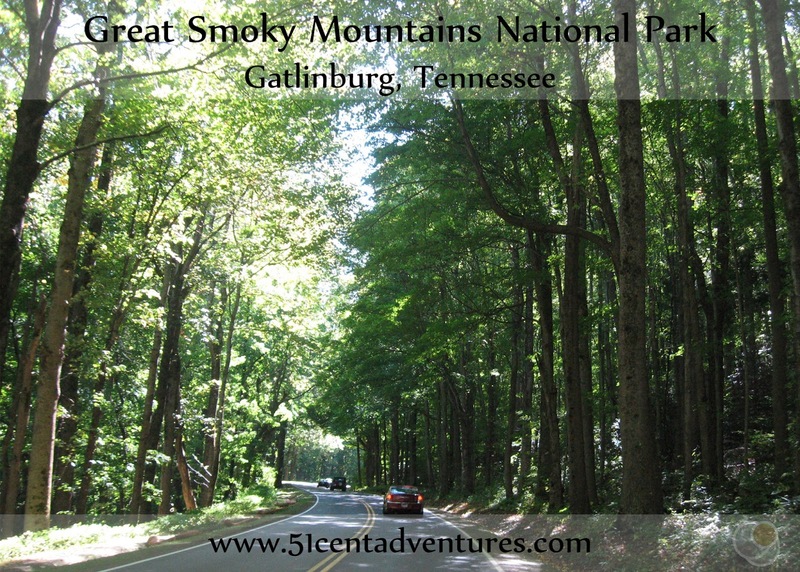 Great Smoky Mountains National Park, is one of the crowning jewels of the Appalachian Mountains. 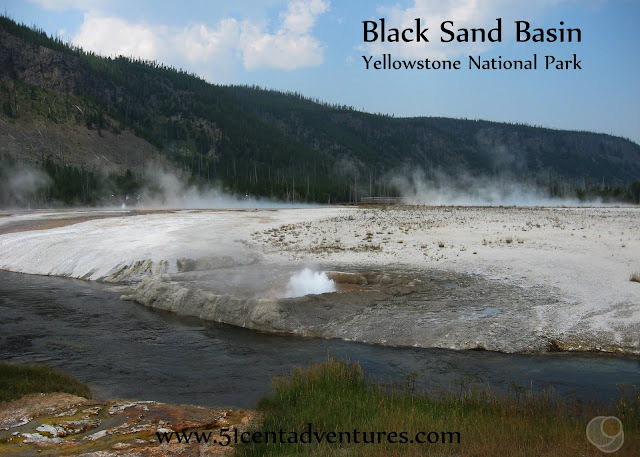 Sprawling over 500,000 acres of tree covered mountains, this national park is an amazing wilderness area that isn't too far from civilization. There are many trails, campgrounds, and visitor centers throughout the park. 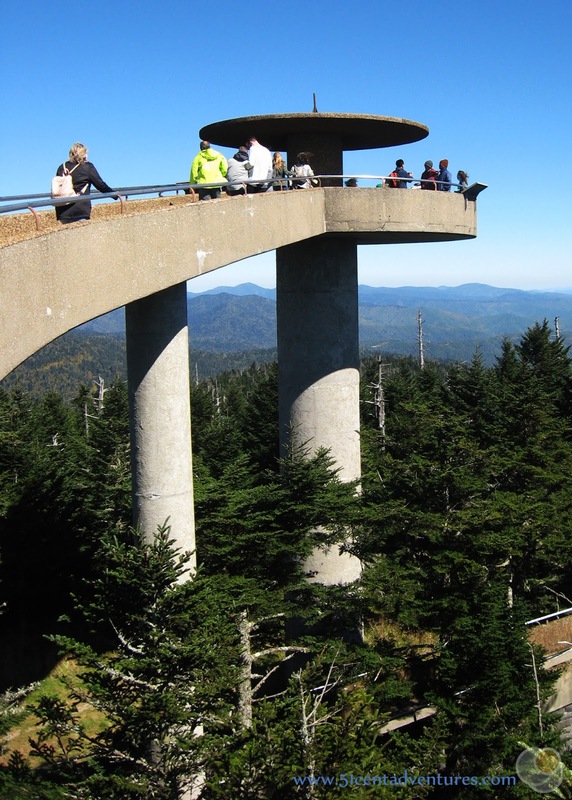 You can also drive up to the highest peak in Tennessee- Clingman's Dome. And all of this is free to visit. Location: Great Smoky Mountains National Park straddles the boarder of Eastern Tennessee and Western North Carolina. Gatlinburg is the nearest town on the Tennessee side. Cost: The park is free to visit. 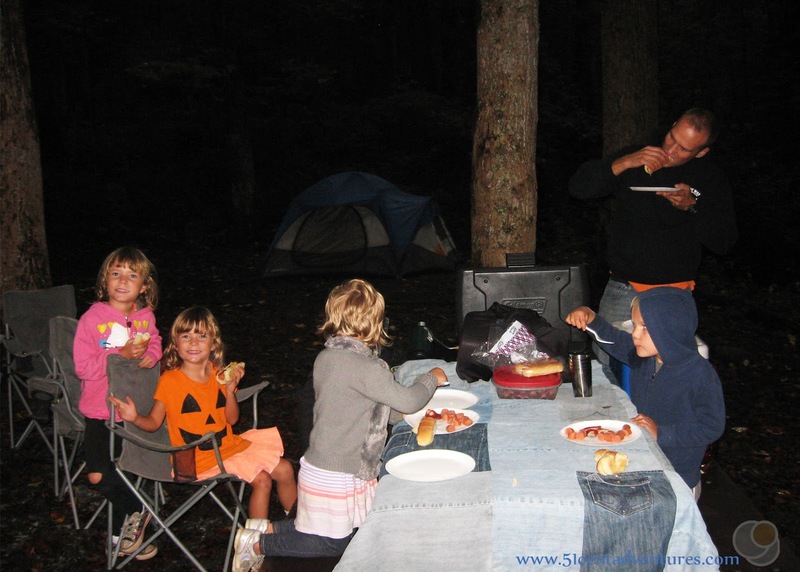 Camping starts at $14 in the front country campgrounds. Operating Seasons and Hours: The park is open all day every day of the year. During the winter certain roads, visitor centers, and campgrounds are closed. Dates of Visit: Saturday, October 8, and Sunday October 9, 2016. This was the location where we stayed night of the second day, and spent most of the third day of our road trip to Tennessee and Kentucky in the fall of 2016. 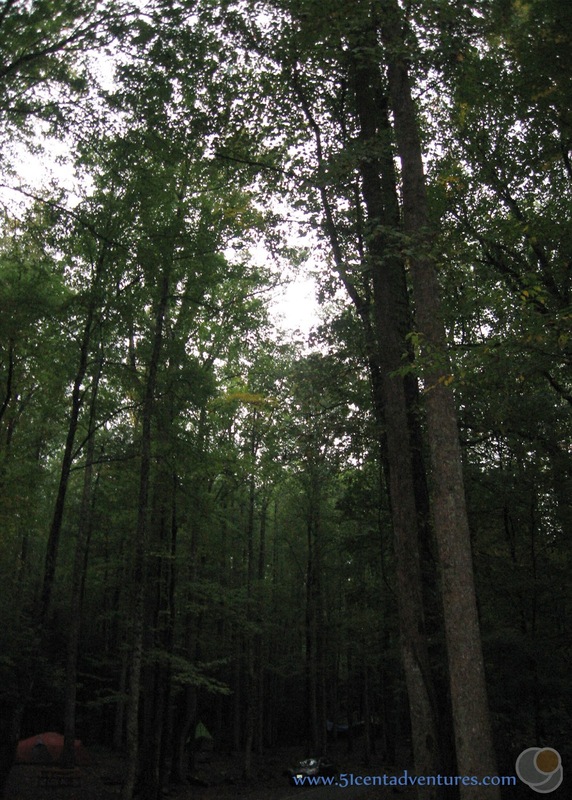 We'd randomly discovered Bryson City in North Carolina in the afternoon, and then crossed back to the Tennessee side of the park where our campground was located. Visiting the Appalachian Mountains was one of the main things my family wanted to do before we moved away from the Southeastern United States. Our original plan was to incorporate a detour through Great Smoky Mountain National Park into our road trip home to Utah. When our move back to Utah was delayed we decided to just visit the mountains during our kids' fall break from school. Unfortunately we weren't able to see as much of the park as we wanted to see. 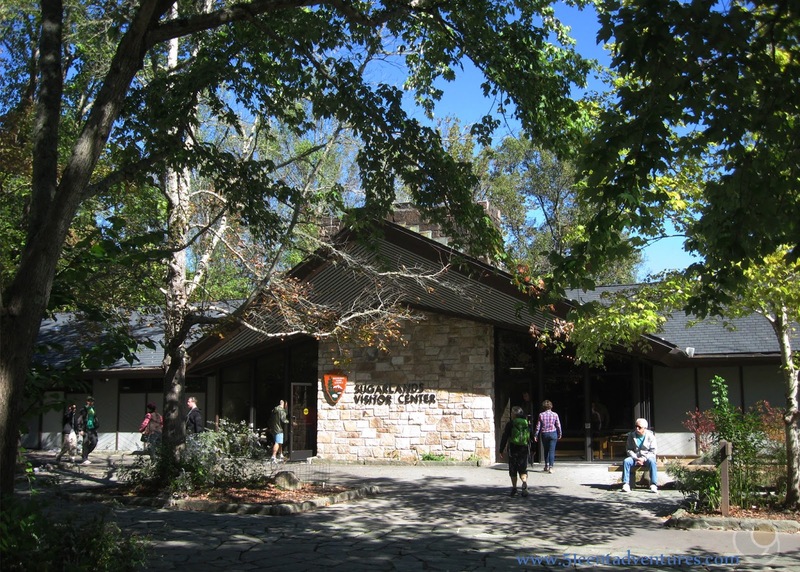 I didn't know this at the time, but Great Smoky Mountain National Park is the most visited national park in the country. We were there on a holiday weekend. That meant that the place was packed with visitors. And that made driving around the park hard. So I'll tell you about the places we did visit, but keep in mind that there is much, much more to the park. Also it's important to note that we visited the park just six weeks before the historic fire that swept through the Tennessee side of the park at the end of November 2016. The park we visited is not the one that exists today. 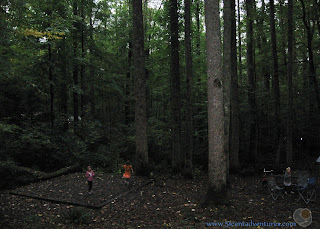 My original pick for where we would stay the night was the Cade's Cove Campground. However, all those campsites were reserved by the time we had an exact date for this road trip. There was basically only one campsite left in the whole park that we could reserve for the night that we wanted. And that was at the Cosby Campground in the northern part of the park. This was one of 26 campsites could be reserved. This campground had another 131 sites that were first come first serve. However, I didn't want to plan on those sites being available. I'm glad I didn't count on those first come first serve sites. By the time we arrived the campground was completely full. 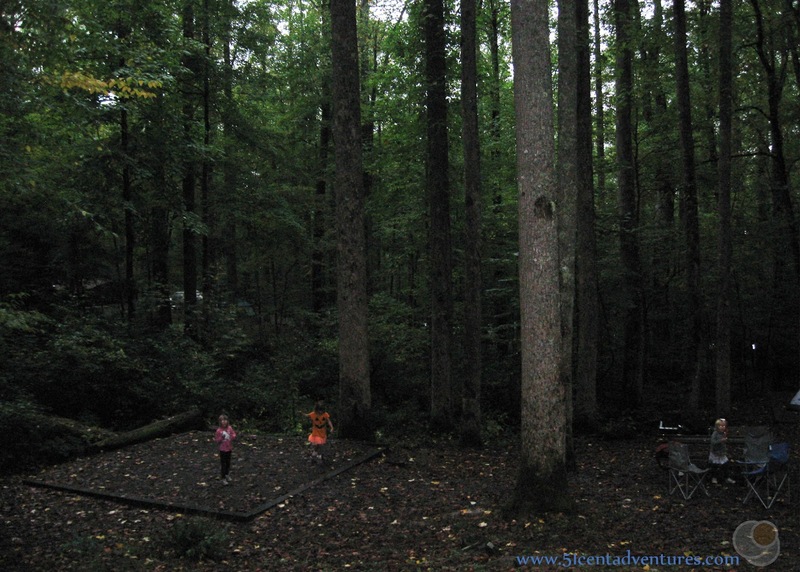 I was so impressed by the tall trees that covered the entire campground. I'd noticed the trees along the side of the road all day, but it wasn't until we stopped for the night that I realized just how giant these trees really were. We arrived in the evening and everything was slightly damp from the low clouds and on and off rain from the day. We quickly got to work putting up the tent and making dinner. Dinner was hot dogs and chili. Everyone was hungry. 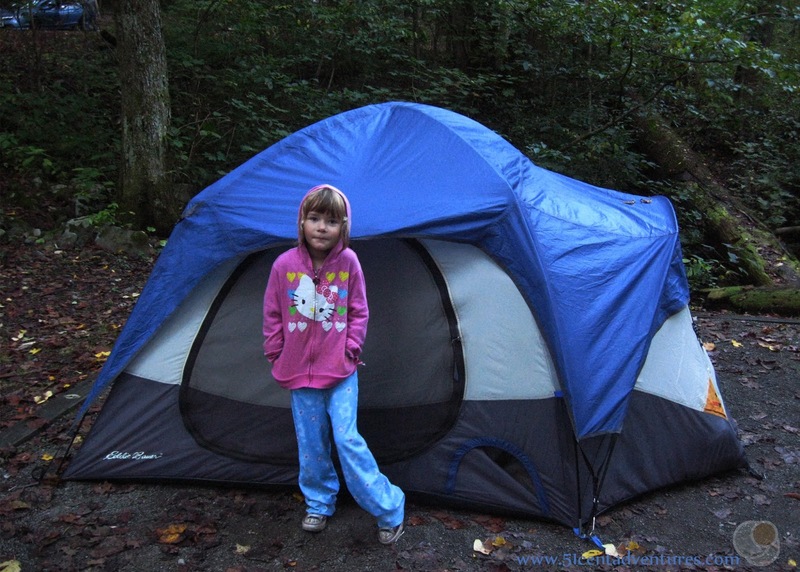 Normally when we camp we have an extra large tent that is tall enough for us to stand up inside and wide enough to fit two queen size air mattresses comfortably. However, we didn't bring that tent along this time. After our camping trip to St Joseph State Park at the end of August my husband and I thought our camping days were done for the year. We were prepping to move back to Utah and planning to put most of our stuff into storage when we got there. Our tent was one of the things we planned to put away for the foreseeable future. We decided to clean it really well before putting it into storage. So we spent a Saturday in the backyard cleaning and re-water proofing the tent. We even sewed up some of the spots on the pole bag that were coming apart at the seems. Then we folded it up really well and put it away. But then we found out we weren't moving in September, and we started planning this road trip to the Smoky Mountains. We didn't want to get the tent back out after we'd spent so much time making it nice again. So as we planned our trip we decided that maybe we'd just use our little tent that we had since we were first married. Using the little tent would certainly cut down on the time it took to set up and take down camp every day. We were going to stay at different campsite every night and neither one of us wanted to mess with the big tent three nights in a row. So the little tent got to re-live it's glory days from back before we had four kids. I was a little worried about how it would work to have all SIX of us in this tent together, but I also knew it was possible. In July of 2015 I'd shared this tent with the kids and my sister when we went to Yellowstone. And in November of 2013 my other sister had shared the tent with her husband, two boys, a teenage foreign exchange student, and a medium size dog. We let the kids fall asleep where ever they wanted to in the tent. While they settled down, my husband and I chilled out in our hammock. 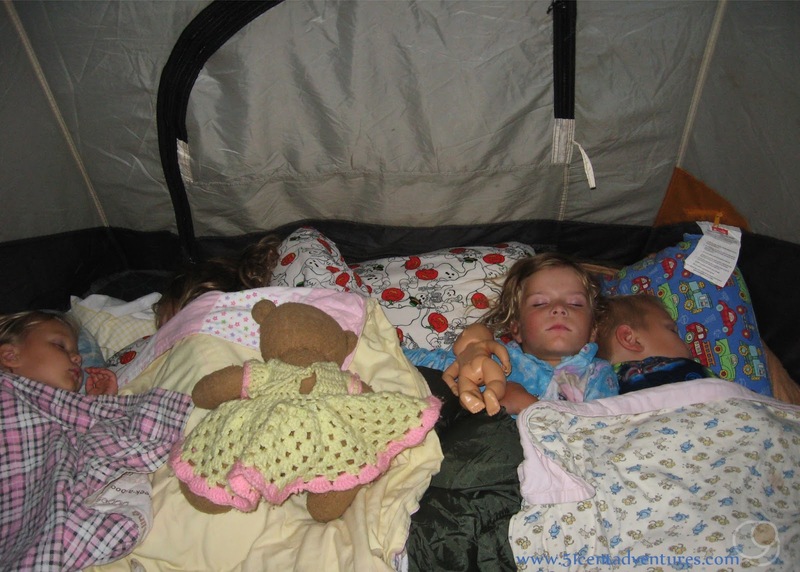 When we were certain the kids were asleep we moved them into the little alcove area of the tent and inflated the air mattress for us. We slept all nice and cozy all night long. 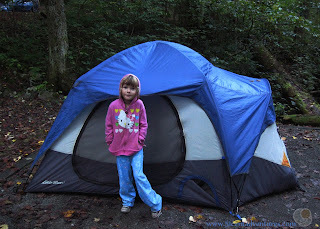 In the morning it was time to go explore more of Great Smoky Mountain National Park. We had a quick breakfast, took down the tent, and packed up the car, and were on our way. Our plan was to bee-bop through Gatlinburg and back into the park. We'd drive up to Clingman's Dome and then come back down. I was hoping we'd have time to check out Cade's Cove before we had to hit to road in order to make it to our campsite in Kentucky before night time. Instead we got stuck in traffic for at least 45 minutes while we tried to navigate through Gatlinburg. The traffic didn't let up as we passed back into the park. 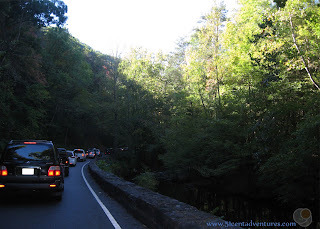 Most visited National Park + Columbus Day weekend = TRAFFIC! Check out that line of cars. Our plans for a quick trip up to Clingman's Dome were starting to look pretty hopeless. I consulted the map and saw that we were heading toward the Sugar Land's Visitor Center. Which was good because the kids were starting to ask to go to the bathroom. So as soon as we could we pulled into the parking lot for the Visitor Center and went to use the facilities. In addition to the bathroom we found a pretty awesome wildlife display. 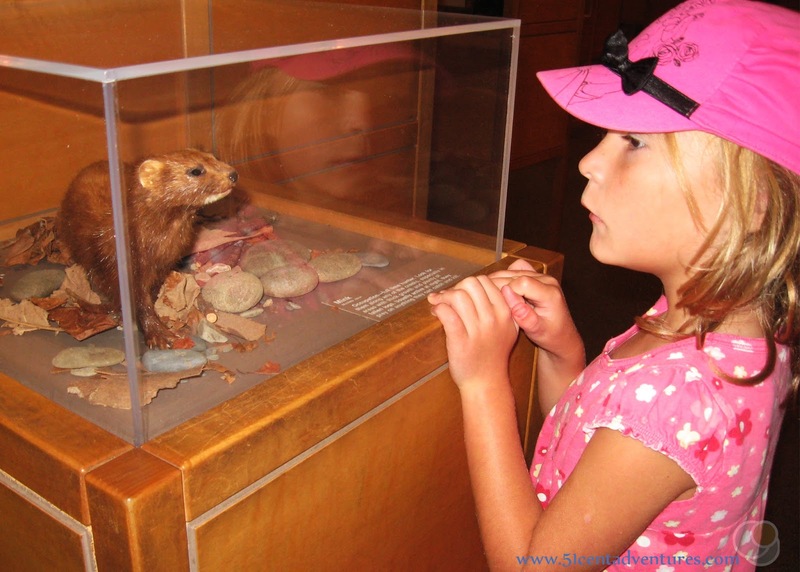 The kids (and us adults) were fascinated by the well preserved animals. 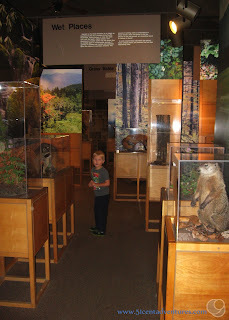 I like displays like this because you see animals up close without worrying that you'll scare them away. 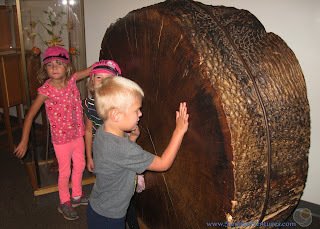 We were also very impressed by this tree trunk. 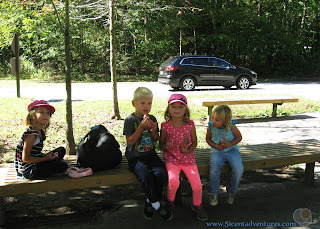 After spending time in the wildlife display we went outside and had a little snack-lunch. We considered cutting out losses and just leaving the park without going to Clingman's Dome, but that was one of the things I'd been looking forward to doing on this trip so I figured we had to do it - no matter how bad traffic would be. Our trip to Clingmans Dome took a lot longer than we originally anticipated, but it was worth it. I was going to include a description of the trip up there in this post, but it was an adventure worth it's own post. 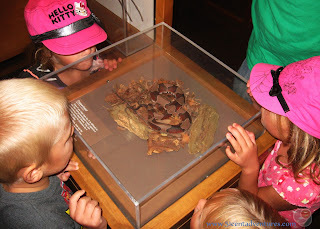 So click this link to read a detailed description of our trip to Clingmans Dome. What was supposed to be a little morning detour ended up lasing until 3:00 in the afternoon. We still had to make it to Kentucky where our campsite for that night was waiting. Exploring any more of the park was out of the question. If we had had time I would have liked to go to Cade's Cove to see the historic buildings scattered throughout the valley. 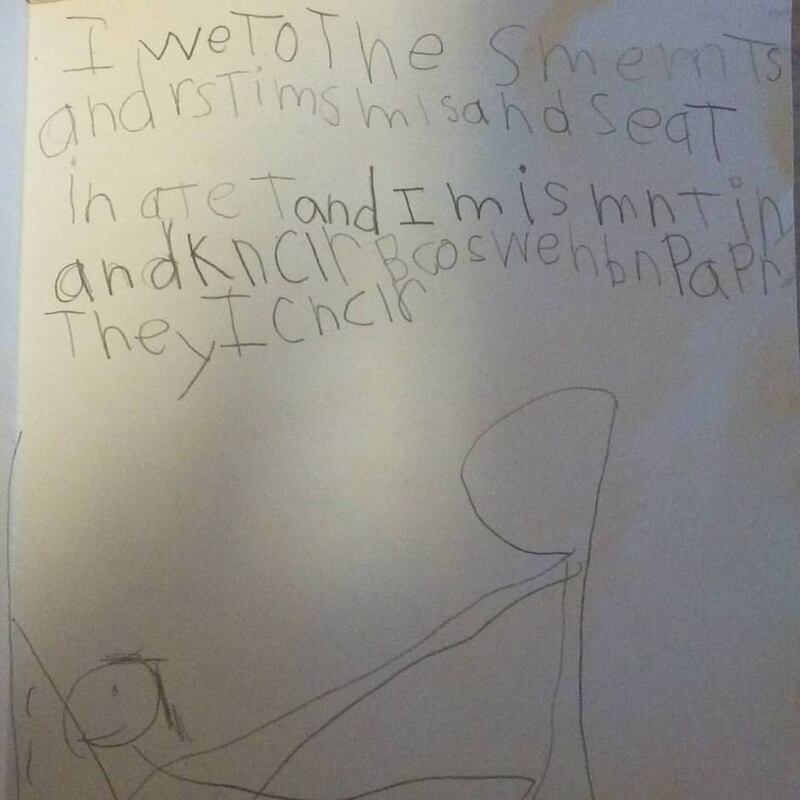 This is something that my daughter wrote in her Kindergarten Class after we got back home. Among other things it says, "We went to the Smoky Mountains. And Roasted Marshmallows. And slept in a tent." The picture is of her getting sick in the car while we drove on the twisty roads. (Which never really happened, but she felt like it was going to happen.) I looks like I'm not the only travel writer in the family. 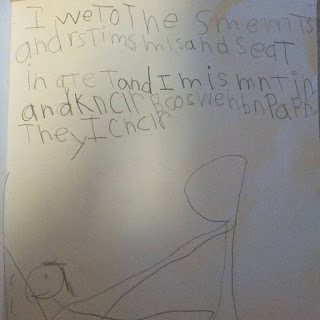 Even now, 5 months later, my kids still talk about the Smoky Mountains. So yes, it was a successful trip. Recommendation: I highly recommend visiting Great Smoky Mountains National Park. Especially if you are feeling a need to see some mountains and trees. However, I do not recommend doing it on a holiday weekend. Directions: Directions to the park really depend on what part of the park you want to visit. It's almost like the park is 11 different islands surrounded by trees rather than water. I've marked the Sugar Land Visitor Center and the Cosby Campground on this map. Places Nearby: I feel like I've said this all through this post, but I really wish we'd had time to visit Cade's Cove. Next Stop: Our next stop was going to be the Cumberland Gap. But that got nixed due to time. Instead we headed to Cumberland Falls State Park in Kentucky where we had a campsite reserved for the night.